There's always a long list of reasons to grow indigenous plants, shrubs and trees. 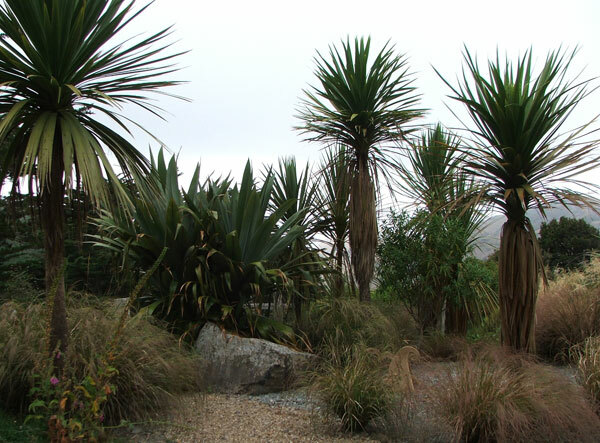 In New Zealand, gardeners are spoilt for evergreens and spiky plants. So what actually happens here? The Politically Correct New Zealand Gardener sources only natives, and they must be natives which specifically grow in exactly that part of the country. But then a country's greatest plant joys (and biggest plant mistakes) come in from the outside. New Zealand gardeners often try to combine the best of all gardening worlds. A gardener I visited recently has deliberately decided to plant only native New Zealand plants. She's an environmentalist, looking after the regeneration of native bush-forest, and running a property off the main electricity grid. It's high on Banks Peninsula above Akaroa, and is called (appropriately) Cloud Farm. 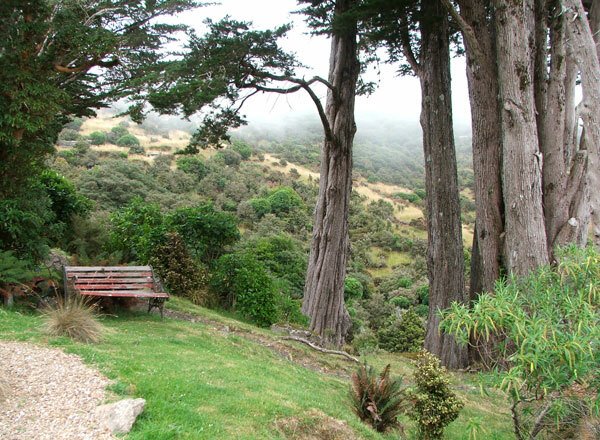 Her patches of bush contain many healthy Totara trees - the Peninsula used to be heavily forested, but the ancient trees were taken for timber. Lots of broadleaf evergreens fill the understory. 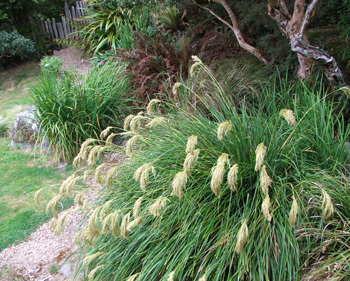 Her 'ornamental' gardens by the cottage are full of spikes - Cordylines, Astelias, Phormiums and different native grasses. Hebes live in pots, as does a Kowhai tree, and there's a lovely swathe of Celmisias, which the gardener calls 'Akaroa daisies'. 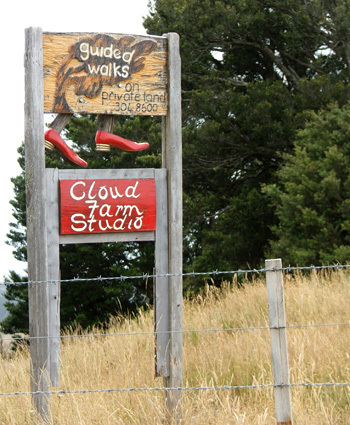 Cloud Farm is at two thousand feet elevation, and often the gardener must think of changing its name to 'Fog Farm'. Even in summer the temperatures can be cool and the views elusive. Lots of paths zig-zag up and down the hillsides. They're well constructed for the wobbly visitor, weed-matted and laid with coarse chippy gravel, with lots of grasses to swoosh past. Just a few potted white pelargoniums and blue Petunias give tiny patches of colour, and the garden is full of rustic sculptural relics - as well as more modern pieces. 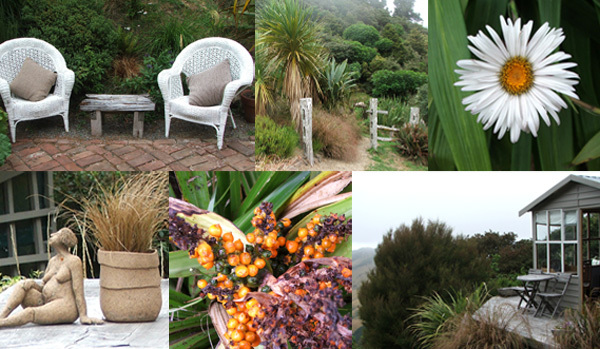 Cloud Farm is a must-see for any gardener (with a car) visiting the South Island of New Zealand. Just think how refreshing it will be - no Italian cypresses, English lavender and box, no potagers or perennial borders, no palms or Victorian bedding plots. You won't even see anything variegated! The owner has published a book on Cloud Farm. Check it out - it's an inspiring read.